Seyfried's pens range from $20 each up to about $200. He uses a Facebook page to market his wares under the business' name, Ed's Pens. KING GEORGE, Va. (AP) — Albert Einstein was dedicated to his M150 Pelikan writing pen. It’s rumored that Queen Elizabeth has used the same Parker 51 since she was crowned in 1953. Samuel Clemens always used a Conklin Crescent, signing his books in longhand with his pen name, Mark Twain. Such a tool may feel archaic to some and nostalgic to others, following a path like that of the wristwatch or cassette tape. In an era obsessed with the latest technological gadgets, who cares about writing by hand? Ed Seyfried does. The King George artisan has found plenty of others who do, too — and are willing to pay handsomely for a good one. Seyfried makes custom pens by hand, using a range of different types of wood from all over the world, or acrylic, or even repurposing items like machine gun shells. To personalize a pen, Seyfried may apply a custom engraving or initials, the colors or insignia from a favorite university, a family crest or flag. “My own personal pen has my submarine insignia as a pen clip,” Seyfried said. He was a nuclear reactor operator in the U.S. Navy’s submarine service. After that, he worked 26 years for Potomac Electric Power Co. and was an instructor at Knolls Atomic Power Laboratory, retiring in 2006. Seyfried — who has lived in King George since 1980 — has worked a variety of part-time jobs since then. 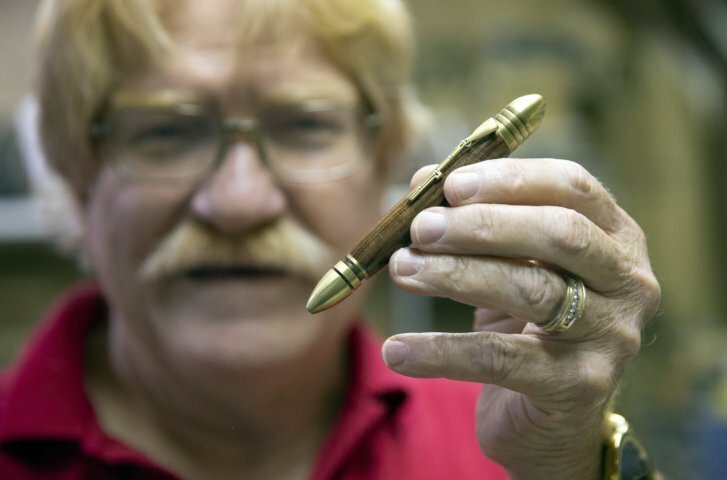 A few years ago he went to a woodworking show at the Fredericksburg Expo Center and saw an area set up for people to make their own wooden pens. Seyfried’s pens range from $20 each up to about $200. He uses a Facebook page to market his wares under the business’ name, Ed’s Pens. Some pens in Seyfried’s collection are the creative result of mistakes made in the workshop. Robert Jarvis of Granite Quarry, N.C., has purchased eight or more pens from Seyfried. A safety director for Universal Forest Products, Jarvis is also a firefighter and gun collector. In addition to pens, Seyfried makes razor handles, key fobs, purse hangers, money clips, seam rippers and wine bottle stoppers. Themes range from every U.S. military branch to music, medicine, quilting, motorcycles and nearly anything else you can think of. “I sell a wedding set with a matching cake knife and server and two champagne glasses,” Seyfried said. He often has a booth set up at local farmers markets or events like Port Royal’s annual Pirate Invasion, selling pens that fit the occasion. Seyfried said he enjoys everything about the business. He pointed out that even those who purchase a Montblanc pen, for example, as nice as it may be, own just one of many.